Made from steel tubing that's coated to fight corrosion and tipped with a rubber cap for safety, this multi-use bracket is the perfect hang-all for whatever needs storage or organization in your workshop, basement or garage. From tools and ladders to toys and garden furniture, you can hang them all with complete confidence that they will stay in place until you need them. Secured in place with two anchor points for stability, this hang-all bracket installs in minutes with basic tools that everyone has on hand. 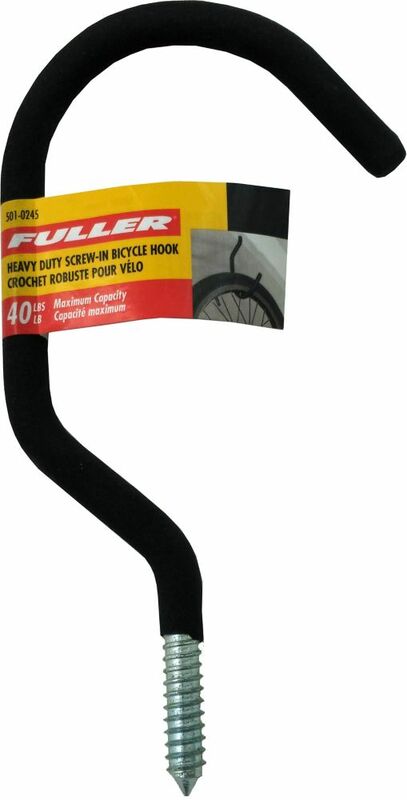 Heavy Duty Screw-In Bicycle Hooks with Protective Foam Rubber A quality bicycle can be expensive. What's more, they can also weigh more, especially if they have a heavier frame. To ensure your bike is held solidly when storing it, you'll want to have a set of these heavy-duty bicycle hooks on hand. Rated to hold up to 30 pounds each, they readily screw into a solid wooden post or beam without tools and make stowing and retrieving your bike fast and easy. The foam rubber ensures the finish on your frame or tire rim doesn't get gouged, scratched, scuffed or marred.